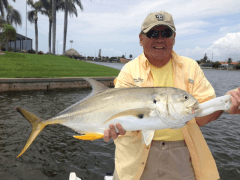 Charter Fishing around Fort Myers and Sanibel Island Florida has been like a roller coaster ride lately. The up and down water temps have the fish more skiddish than a cat in a rocking chair store. We had some great days during January and we had some of the worst days during the month also. Reports of a few nice Spotted Sea Trout and some decent Redfish catches have been noted along with decent catches of Mangrove Snapper and Sheepshead. We’ve had some nice days finding some Redfish tailing on the extra low tides. No matter how you look at it, we’ve had some great days of weather and some great days of fishing in the month of January.